This is my latest purchase, and first project vehicle! 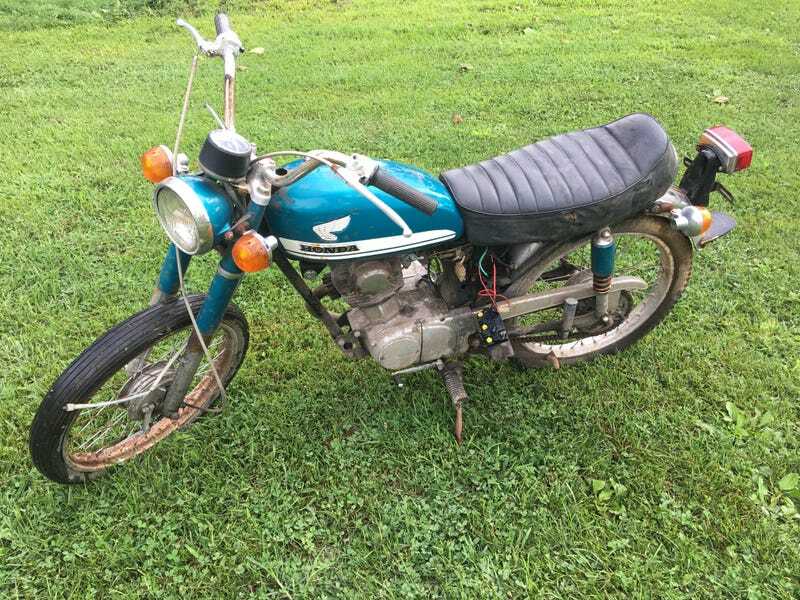 A lovely little 1970 Honda CB100 in “Candy Blue Green”. Needs some love for sure. Heres the rundown of the current known fixes needed. 2. Wheel spokes replaced, possible wheels replaced, they’re pretty rusty. 3. Gas tank needs cleaned out, hard to tell how long the gasoline has been in the tank but its separated into; clear, red, and solid layers. 4. The fuel valve was open so the carburetor is probably completely gummed up. 5. front brakes cable is disconnected. Not a big deal. 6. The key is missing. 7. Registering will be interesting, but I have a plan that should work. 8. The seat is functional but the bottom edge of the seat structure is just about rusted/rotted away. I really want to keep the original seat though. Might have to get creative. Pretty cool little bike, lots of cool features I’m still discovering. Really excited that it has a built in center stand. Cool little speed to gear guide on the speedo. The engine does turn over very easy and smooth when kicked once, thats a good sign. Clutch works and the bike will go into gear. Shouldn’t be terrible hard to get it running. I can't stop smiling Im so happy. First motorcycle also.